The competitive landscape in the global aroma chemicals market is highly consolidated, states a new report by Transparency Market Research (TMR). The top four participants, namely, Givaudan, Firmenich SA, Symrise, and IFF, held around 54% of the overall market in 2015. These companies are investing heavily in research activities in order to develop technologically advanced products. Going forward, a shift in their focus towards mergers, acquisitions, and strategic alliances can be observed in the years to come, states the report. 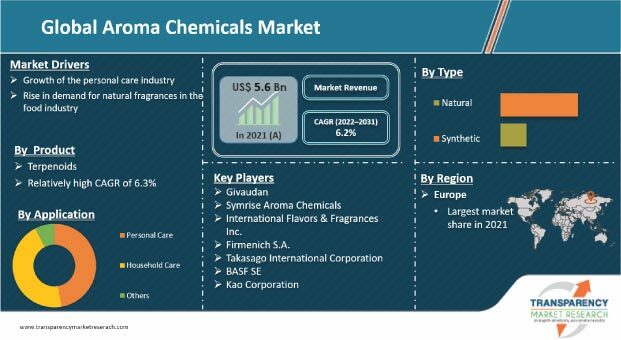 As per the report’s estimations, the global aroma chemicals market, which stood at US$3.85 bn in 2015, is anticipated to rise at a CAGR of 6.20% over the period from 2016 to 2024 and reach a valuation of US$6.57 by the end of the forecast period. Benzenoids have emerged as the most valued product in this market and are anticipated to remain enjoying a strong demand across the world over the next few years, notes the market study. In this research report, aroma chemicals have broadly been classified into two types; Natural and synthetic. Among the two, the demand for synthetic aroma chemicals is greater among consumers. Although analysts expect the trend to remain so over the forthcoming years, the demand for natural aroma chemicals is likely to demonstrate a high-paced rise during the period of the forecast, thanks to their increasing popularity as a safer, greener, therapeutic, and more sustainable alternative to synthetic aroma chemicals. The report further presents a geographical analysis of the worldwide market for aroma chemicals. According to the study, the global market has its presence across North America, Europe, the Middle East and Africa, Asia Pacific, and Latin America. Europe led the overall market in 2015 with a share of 33.3% and is anticipated to maintain its dominance throughout the period of the forecast. Asia Pacific, among other regional markets, is expected to display promising growth potential in the near future, states the research report. “The global market for aroma chemicals is gaining signifcantly from the widening application range of aroma chemicals,” states the author of this study. Initially, the application of these chemicals was limited to the household and personal care products; however, now their increasing usage in the food and beverages and medical and healthcare industries is creating substantial growth opportunities for this market. Over the coming years, the demand for aroma chemicals is likely to increase remarkably, thanks to the rise in the disposable income of consumers in emerging economies, such as Brazil, China, India, and Africa, enabling them to spend on luxurious personal care products. However, the presence of stringent rules and regulations forcing companies to follow specific compliance policies may hinder the growth of this market in the years to come, reports the study.